Mosaic Clubhouse has been announced as the finalist for the category of Public Mental Health & Wellbeing as part of the Health & Wellbeing Awards 2017 organised by the Royal Society For Public Health. The Evening Sanctuary hosted by Mosaic Clubhouse was short-listed for the ‘Working Together’ category of the 2016 Lammy Awards. Mosaic Clubhouse won The Charity Governance Awards Managing Turnaround category 2016. The Charity Governance Awards are organised by The Clothworkers’ Company – a City Livery company that supports trusteeship initiatives – in partnership with not-for-profit consultancy NPC ( New Philanthropy Capital ), volunteer matching charity Reach, and recruitment specialists Prospectus . You can listen to our former Chief Excecutive's interview on the Clubhouse model, why we entered and what winning has meant to the Mosaic Clubhouse community here. 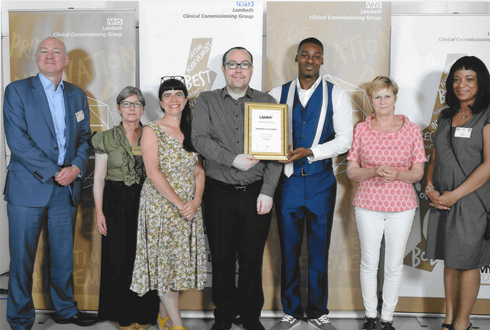 Awarded the MHPF Mental Health Voluntary Sector Award 2015 for Integration. 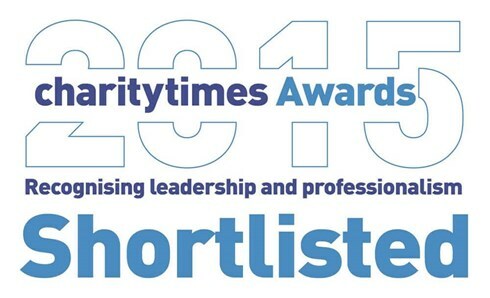 Shortlisted for the Charity Times Awards 2015 . Winner of the 3rd Sector Care Awards 2014 for Collaboration. Highly commended by the Charity Awards 2014. Clubhouse International and Foutain House/NY received $1.5M Hilton Humanitarian Prize for work to reduce human suffering. Channel 4 highlights Mosaic's drive to support the recovery from mental illness among black men , 3rd of April 2018. The London Community Foundation, 5th March 2018, Keeping it together . Mosaic Clubhouse is one of 8 case studies in this report demonstrating how they are making a significant difference to the mental health in Londoners. Mosaic Clubhouses contributed to this publication by Inspiring Impact, Involving users in shaping services , Shona Curvers, Erica Bertolotto, Rachel Tait, February 2018. Firesouls , 20th September 2017, interviewed Maresa (former CEO) on her perspective on the future of mental health services, ‘This is the most powerful model of rehabilitation I have ever seen’ . ITV News , 11 May 2017, featured Mosaic Clubhouse as part of Mental Health Awareness Week. Lambeth Cuts, 30 March 2017. Published an article on Mosaic Clubhouse and the impact of austerity cuts. London News Online, 17 March 2017. Maresa Ness, our former Chief Executive, is quoted in an article about raising mental health awareness. London News Online, 3 March 2017. Jack Dixon writes of Mosaic Clubhouse's pending partnership with Lambeth and Southwark Mind to pilot a Psychosis Therapy service. South London Press, 16 December 2016. As part of the Change is Possible campaign, Mosaic Clubhouse Members and Staff are interviewed for a special feature. October 2016, Charity Governance Awards published a podcast interview with former Mosaic Clubhouse Chief Executive, Maresa Ness, following our award in their Turnaround category for 2016. July 2016. PHE News 2016, Summer . Features an article on our member, Gabriel, and his successful Transitional Employment Placement with PHE. July 2016. Healthwatch Lambeth Annual Report , includes a summary and quotes from their earlier Enter and View visit to Mosaic Clubhouse. July 2016. Charity Governance E-Book , featuring award nominees and winners, including Mosaic Clubhouse. Brixton Blog, 9th July 2016. David Child writes about the official launch of Lambeth's Evening Sanctuary, hosted by Mosaic Clubhouse on 6th July 2016. Lambeth Talk, June 2016 . Features an article celebrating Mosaic Clubhouse winning The Charity Governance Awards Managing Turnaround category, 2016. It also mentions the clubhouse's Festival of Learning events scheduled for 3O June 2016. Healthwatch Lambeth Enter and View Report, May 2016 . Mosaic Clubhouse was the first Mental Health service in the community the group had visited. Brixton Blog, 12th May 2016, breaks the news of Mosaic Clubhouse's win of The Charity Governance Awards Managing Turnaround category, 2016. Former Mosaic Clubhouse Chief Executive, Maresa Ness, interviewed by London Live News, 22nd April 2016. This followed the news of the clubhouse being shortlisted for The Charity Governance Awards 2016. Mosaic Clubhouse Features in the Brixton Blog, 21st April 2016 , following the announcement of its shortlist in the Managing Turnaround category, for The Charity Governance Awards 2016. BBC 1 News: Mosaic was featured on the 6 o’clock news report , re: King’s Fund report. The Evening Sanctuary is mentioned on the Crisis Care Concordat website under Local Inspirations. Mosaic Clubhouse was mentioned Duncan Selbie’s (Public Health England) ‘Friday Message’ on 26th June 2015. Mosaic Clubhouse & the Living Well Partnership are mentioned in the National Guardian Alliance contract in Lambeth . A blog by the Innovation Unit on the Sanctuary crises service ran by Mosaic Clubhouse. Mosaic Clubhouse has been praised as an example of how to support people experiencing mental health crises in the Care Quality Commission (CQC) report, 'Right here, right now: Mental health crisis care review' . Mosaic Clubhouse is mentioned on the BBC News story covering the Care Quality Commission (CQC) report, 'Right here, right now: Mental health crisis care review' . Mosaic Clubhouse is mentioned at the end of the footage as an example of best practice. Mosaic Clubhouse was praised for its good practice by Governance International in November 2014. Read more here . Brixton Blog article on Mosaic Clubhouse recieving money from the Lambeth Giving Fund for equipment to help members thrive and learn new skills- Lambeth Giving Fund helps Brixton charity and community centre. Our former CEO Maresa Ness on My Brilliant Moment broadcast on the Community Channel. Recent publications on the Living Well Collaborative website about our hospital inreach programme hosting the Living Well Partnership at 65 Effra Road. South London paper The Voice reported on Mosaic Clubhouse's move to Brixton and the opening of its new information service in August 2013. Read more here . Mosaic Clubhouse features as a case study in this report: NESTA & Innovation Unit (2013), More than medicine: new services for people powered health . Keeping it together - mental health report . of Psychosocial Rehabilitation; Adm Policy Ment Health 45:28–47. Project to Evaluate the Impact of Fountain House Program on Medicaid Utilization and Expeditures, Health Evaluation and Analytics Lab, New York University, December 2016 Analysis, Claudia Solís-Román, M.P.A. James Knickman, PhD. European Clubhouse Newsletter (2015/16 Winter Edition, Pages 11-19) gives details of the recent study into the benefits of the Clubhouse model. Mosaic Clubhouse features as a case study in: Local early action: how to make it happen . Report from the Southwark and Lambeth Early Action Commission, NEF. Page 46 & 52. Tanaka K., Craig T & Davidson L (2015), Clubhouse Community Support for Life: Staff–Member Relationships and Recovery , Journal Psychosocial Rehabilitation Mental Health, Springer. Tanaka K & Davidson L (2015) Reciprocity in the Clubhouse Context , International Journal of Psychosocial Rehabilitation, Vol 19 (2) 21-33. Latest research from Clubhouse International . Recent Clubhouse research shows that Clubhouses: promote recovery, reduce hospital stays, help obtain employment, are cost-effective, Improve well being & quality of life. Mosaic Clubhouse features as a case study in a new publication by NEF on Co-Production- Co-Production in Mental Health, A literature review , Commissioned by Mind. Clubhouse International participated in the development of two recent reports in conjunction with the World Innovation Summit for Health (WISH) (2013). In these reports, Clubhouse is identified as an innovative and effective mental health service program that could be included in any mental health service system wishing to make progress for social change. Additionally, in association with these reports, the Clubhouse Model has been included in a recent online database providing mental health service system decision makers with information about various innovations. People Helping People: Peer support that changes lives, 2013 . A report by Nesta into the benefits of peer support using learning and evidence on four peer support models. A report by Nesta & Innovation unit, featuring Mosaic Clubhouse as a case study- More than medicine: new services for people powered health, 2013. Esko Hänninen (2012), Choices for Recovery Community Based Rehabilitation and the Clubhouse Model as Means to Mental Health Reforms. Juvenes Print - Tampere University Print Oy, Tampere 2012, Finland. Annual Report & Accounts 2016-2017. Annual Report & Accounts 2015-2016. Annual Report & Accounts 2014-2015. Annual Report & Accounts 2013-2014. We have recieved a three year accreditation from Clubhouse International . You can read the report HERE .